Several PA-based Christian organizations are getting in the holiday spirit with attacks on Israel, including ‘Jews killed Jesus’ libel. A new report from NGO Monitor reveals that several Christian organizations that support the Palestinian Authority are using Christmas to attack Israel. Holiday propaganda ranged from half-truths aimed at portraying Israel as oppressive to “crude anti-Semitism” based on historic Christian accusations of Jews being prophet-killers, the group said. The report, titled, “O Boycott All ye Faithful,” criticized groups including Christian Aid, Sabeel, Kairos Palestine, and Israel Palestine Mission Network, Presbyterian Church (USA). The latter group has published a daily advent devotional headed by a picture in which Mary and Joseph, parents of Jesus, are trapped behind a wall styled on Israel’s security barrier between Bethlehem and Jerusalem. The first entry compares Israel to the Romans who once brutally oppressed the Jewish people. “Jesus lived when the Roman empire had recently come to his land and made it part of the empire. The Romans were very cruel to any of those who dared to resist the occupation… As we look at the complexity of the Palestine/Israel issues today, I am struck by a sense of déjà vu,” wrote Reverend Richard Toll. His message also included a warning to “collaborators,” whom he said Christians must expose. The PA considers “collaboration” with Israel in fighting terrorism a death penalty offense. Further writings continue the trend of extreme criticism of Israel, with some hinting that modern-day Palestinian Authority Arabs are like Jesus, while Israel is like the Romans who killed him. The annual Christmas message from Sabeel compares Israel to the Roman Empire as well, as does a video message posted by the Evangelical Lutheran Church in America. The security barrier was built following a brutal wave of suicide attacks targeting Israeli civilians. Jerusalem, just minutes from Bethlehem, was hit by dozens of attacks murdering hundreds of people. Several of the attackers were from Bethlehem, among them a bomber who targeted high school students on their way to school, killing and wounding several dozen. Unsurprisingly, the issue of terrorism in Bethlehem was not mentioned by any of the organizations. 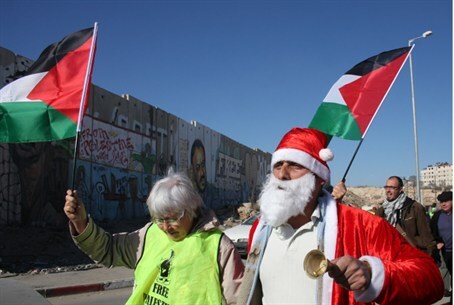 “NGOs and well-known charities are exploiting the 2012 Christmas season with anti-Israel campaigns… The repeated emphasis on Bethlehem highlights the dark theological messaging,” warned NGO monitor. “With this abuse of holiday and religious symbols, these NGOs and charities that claim to promote moral agendas are not offering messages of peace and good cheer. Rather, their intolerant and theologically charged messages exacerbate an already polarized and violent conflict,” the group charged. Many of the offending groups are funded by the European Union and European governments. Sabeel is funded by Sweden, and Christian Aid by the UK, Ireland, Norway and the EU. “As funders, these governments are enablers and share the moral responsibility for the actions of the NGOs,” NGO Monitor declared.